How do I delete custom images I made in my computer? I created a custom image for a test, and everytime I download the program to my brick, the image shows up in the folder despite me not using a display program. How do I fix this? 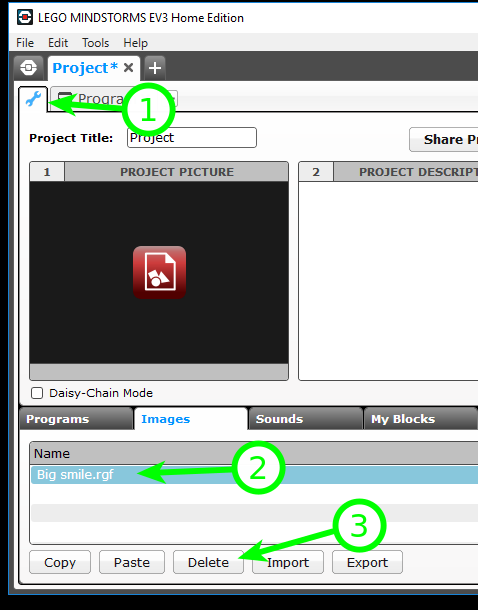 You should be able to go to the project tab (1) - it's the one with the wrench icon - and delete any unneeded items. Just select the item (2) and click the Delete button (3). Not the answer you're looking for? Browse other questions tagged ev3 ev3-g or ask your own question. Does NXC work with EV3?